Prairies are wild and rugged grasslands, whose inhabitants depend on each other and their surroundings. Author and illustrator Karen Patkau takes us on an amazing journey through one of the earth’s most important ecosystems. Discover the plants and animals that thrive in its unique conditions – from pincushion cacti, prairie crocuses and sagebrush to burrowing owls, dung beetles and yellow-bellied racers – and how they interact with their grassland environment. Find out about the prairie’s vital role in food production for the world’s population. • “Every continent, save Antarctica, has prairies providing great benefits. Prairies constitute a special ecosystem unlike any other. A variety of flora and fauna are native to grasslands and create a circle of life, both beautiful and interesting. Karen Patkau, author/illustrator of this book in a series of eco-system books, has put together a beautiful book that will be of great interest to youngsters of elementary school age. Each spread in the book has just enough text to not be daunting to youngsters. The text focuses on a particular group of plants and animals illustrated in glorious detail that, at first glance, might be mistaken for a photograph, but on close examination, is a painting. Kids will be fascinated by all the creatures that make their homes on and under the prairie, how the seasons affect the prairie wildlife, and even how fires can be beneficial. • “… written for younger and older children alike, this book captures the attention of children and fires their imagination at the same time. 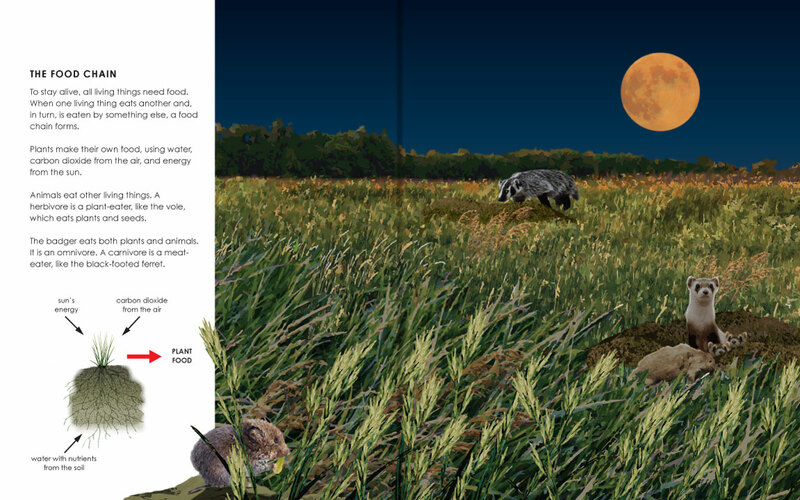 Different aspects of a grassland ecosystem are illustrated and explained, and every creature, plant or landscape feature shown in the pictures is mentioned in the accompanying text. The overall message … is that of conservationism – it explains the ecosystem as it was, as well as what has become of it, and what endangers it. In this particular book, global warming, overpopulation and excessive farming are mentioned and duly criticized.